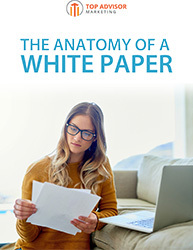 For financial advisors, a white paper is a strong and influential piece of content marketing. It’s a concept piece that shares an idea people should know about, need help identifying (and understanding) and help solving. The paper creates credibility and authority.